" I AM SO EXCITED TO I AM SO EXCITED TO BEGIN USING MY NEW FEET! I WOULD ONLY SUGGEST THAT YOU INCLUDE INSTRUCTIONS ON HOW TO USE EACH ONE. 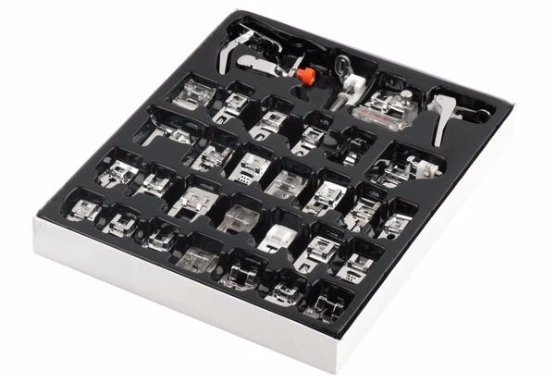 – KLEIN K. "
If you’d like to take your own sewing skills and craftsmanship to another level of greatness, then this easy-to-use complete set of handy ‘Snap-On’ presser feet will take you there! Not only will this set save you time, but you’ll get even more stunning sewing results thanks to the variety and high quality of these feet. Plus, when you invest in the whole set, you’ll save a small fortune as well by not having to buy each piece individually! 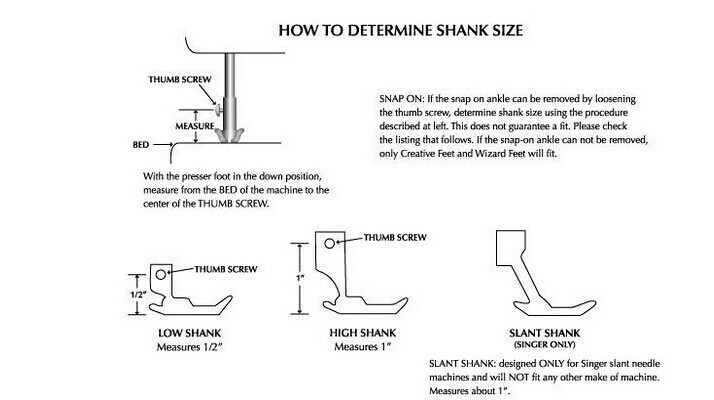 FITS MOST SEWING MACHINES: All feet fit home; domestic sewing machines built after 1980 that have a low-shank system. If they don’t fit your machine, we’ll refund your purchase, 100% guaranteed! 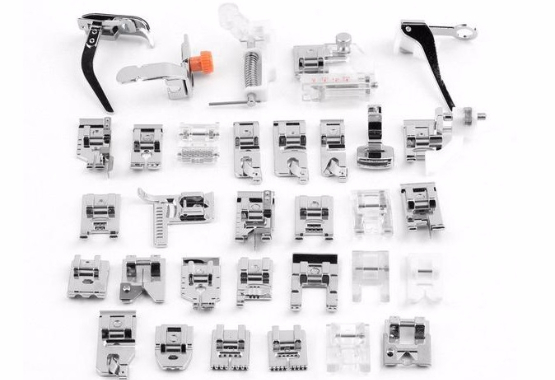 Fits on these brand machines: Singer, Brother, Babylock, Euro-Pro, Janome, Kenmore, White, Juki, New Home, Necchi, Elna, Husqvarna Viking, Toyota and other low-shank domestic machines. 1. 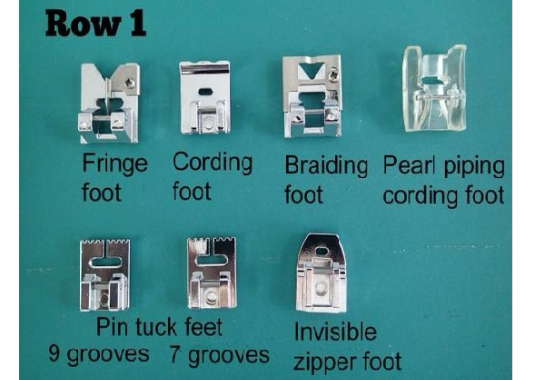 Fringe Foot - A fringe foot (also known as a looper foot or tailor tack foot) is a cool addition to your sewing toolbox. With just a zigzag, you can incorporate a lot of decorative, textured looks to your projects. 2. Cording Foot - The cording foot is generally referred to as the multi-cord foot. This foot comes with a variety of holes for insertion of cording used in decorative stitching and embellishing, which is why it is often called the multi-cord foot. 3. Braiding Foot - The braiding foot is one of many types of feet used in couching, which is a form of decorative embellishment, where a length of braid, cord, piping, ribbon, thread, trim or yarn is couched or stitched over to attach it to a fabric project. 4. Pearl Piping Cording Foot - The piping foot is designed with two grooves on the underside and will hold and cover the cord when making piping tape. 5 - 6. Pin Tuck Feet - Pintuck feet are designed to create small tucks in your fabric virtually effortlessly. With a pintuck foot plus a twin needle, you can create beautiful, evenly spaced fabric tucks in a snap. 7. Invisible Zipper Foot - The zipper foot act as the guide allowing for perfectly positioned stitches that won't show on the front of your garment. 8. Hole Cording Foot - This foot allows you to add decorative cording, yard, and elastic thread easily and perfectly. 9. 6mm Round Rolled Hem Foot - A good tool for handling those failed overlock and creating perfect rolled hem. 10. Teflon Foot - This foot prevents fabric from tugging and pulling against the foot for even feed and better stitch quality. 11. Open Toe Clear Embroidery Foot - This foot is perfect for projects that require visibility and stability, such as applique, surface embellishments, and stitching around intricate areas with decorative stitches. 12. 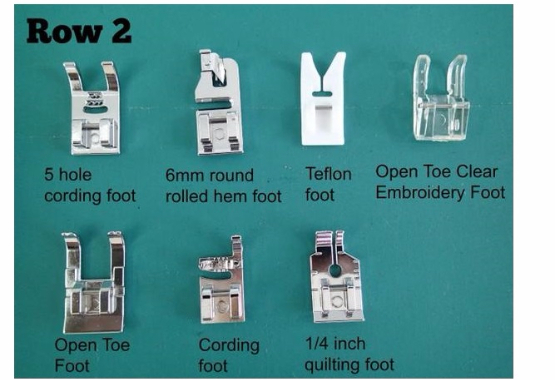 Open Toe Foot - The Open Toe Foot can be used for machine applique, decorative stitching and many types of surface. 13. Cording Foot - This foot comes with a variety of holes for insertion of cording used in decorative stitching and embellishing, which is why it is often called the multi-cord foot. 14. 1/4 Inch Quilting Foot - The Quarter Inch Foot is the essential foot for perfect 1/4 inch seams making quilting easy, fast, and accurate. 15. Straight Stitching Foot- The Straight Stitch Foot is designed to glide evenly over fabric. The built in measuring gauge is great for accurate top stitching and the toes are a useful edge stitching guide. 16. 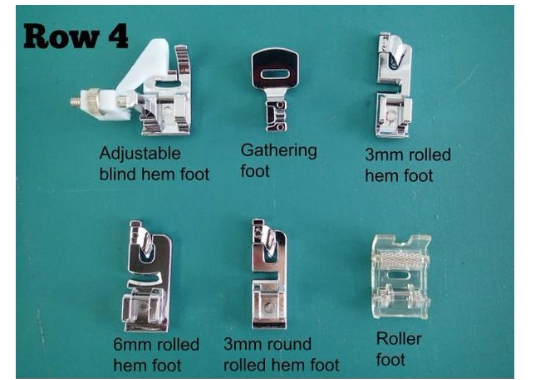 1/4 Inch Foot With Guide - The 1/4" Quilting Foot with Guide allows you to feed your quilt pieces through your sewing machinewith an exact quater inch seam allowance. 17. Edge Stitching Foot - The Edge Stitching Foot guides topstitching and edge stitching perfectly. Stitch folded tucks accurately. 18. Satin Stitch Foot - The Satin Stitch Foot, is also sometimes called an “applique” or “special purpose” foot, is used for sewing decorative stitching or surface embellishments. 19. Hole Cording Foot - This foot allows you to add decorative cording, yard, and elastic thread easily and perfectly. 20. Edge Joining Foot - The edge joining foot is used to sew fabric edges together side by side. 21. 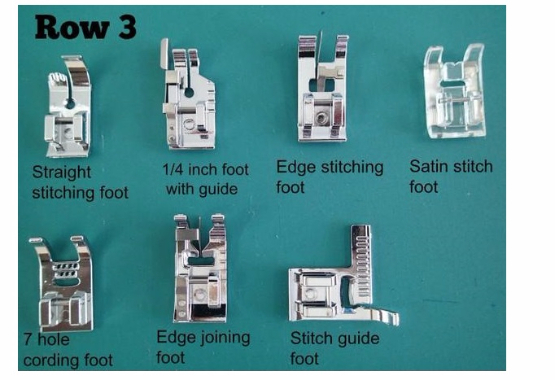 Stitch Guide Foot - The Stitch Guide Foot is used for accurate sewing of more than one row of stitching. Incrementally marked ruler. 22. Adjustable Blind Hem Foot - The Adjustable Blind Hem Foot can be moved from side to side to fine tune the amount of fabric caught by the blind hem stitch. 23. Gathering Foot - The Gathering Foot is used to form soft gathers in fabric. 24. 3mm Rolled Hem Foot - Is used for light to medium weight fabrics for clothing and home decorating items without having to pre-iron the fabric edges. 25. 6mm Rolled Hem Foot - 6 mm rolled hem foot sews a very narrow hem, providing a professional edge finish. 27. Roller Foot - This foot has rollers that roll against the fabric and act very much like the track on a bulldozer for sewing up and over heavy seams. 28. Darning Foot - Darning foot is used to repair holes & tears, but can also be used for free motion embroidery, stipple quilting and creating monograms. 29. Adjustable Binding Foot - The binding foot is adjustable so that it can deal with varying widths of binding. It works with bias binding and is perfect for use around gentle curves and circles, and it also works with straight cut binding for straight edges too. 30. Free Motion Foot - This foot will give you more stability which is useful when stitching thick layers, but it does make it difficult to get close to the edge of the embroidery hoop. 31. 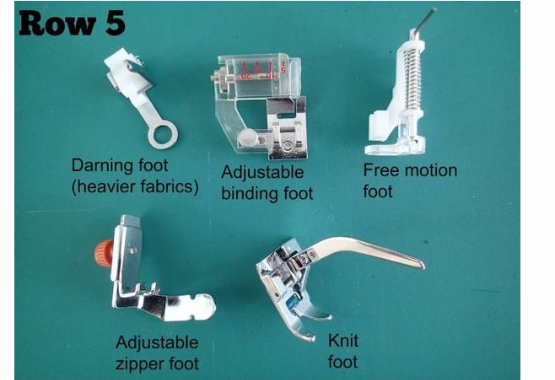 Adjustable Zipper Foot - The adjustable zipper foot has many applications and can be used to sew almost any type of zipper. 32: Knit Foot - This foot simultaneously stitch and finish heavy knit fabrics or imitation furs. Copyright © I Love Quilting Forever. All rights reserved.